As the Gillard government’s plan for a carbon prices sends Coalition stocks soaring, attention is increasingly focusing on what opposition leader Tony Abbott believes in about climate change and how to deal with it. Today in Crikey, Tony Abbott debates one of his most formidable opponents on the issue — Tony Abbott. Tony Abbott: Climate change is a relatively new political issue, but it’s been happening since the earth’s beginning. The extinction of the dinosaurs is thought to have been associated with climate change. Tony Abbott: I’ve always thought that climate change was real because I’ve always known about the ice age and other things which indicate that over time climate does change. 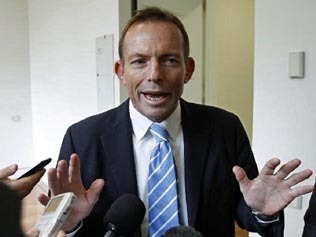 Tony Abbott: I am, as you know, hugely unconvinced by the so-called settled science on climate change. Atmospheric concentrations of carbon dioxide have significantly increased since the spread of industrialisation, but it seems that noticeable warming has only taken place between the 1970s and 1990s. Tony Abbott: We have a clear policy on climate change. Climate change is real. Tony Abbott: I mean in the end this whole thing is a question of fact, not faith, or it should be a question of fact not faith and we can discover whether the planet is warming or not by measurement. And it seems that notwithstanding the dramatic increases in man-made CO2 emissions over the last decade, the world’s warming has stopped. Now admittedly we are still pretty warm by recent historical standards but there doesn’t appear to have been any appreciable warming since the late 1990s. Tony Abbott: It’s quite likely that increased carbon dioxide in the atmosphere has had some effect on climate, but debate rages among scientists over its extent and relative impact given all the other factors at work. Tony Abbott: We can’t conclusively say whether man-made carbon dioxide emissions are contributing to climate change. If they are, we don’t know whether they are exacerbating or counteracting what might otherwise be happening to global climate. Even if they are adding to climatic extremes, humanity may be able to cope with only modest adjustments. Tony Abbott: What we can say, though, is that we should try to make as little difference as possible to the natural world. As well, prudent people take reasonable precautions against foreseeable contingencies. It’s the insurance principle. Tony Abbott: OK, so the climate has changed over the eons and we know from history, at the time of Julius Caesar and Jesus of Nazareth, the climate was considerably warmer than it is now. And then during what they called the Dark Ages it was colder. Then there was the medieval warm period. Climate change happens all the time and it is not man that drives those climate changes back in history. It is an open question how much the climate changes today and what role man plays. Tony Abbott: I am confident, based on the science we have, that mankind does make a difference to climate, almost certainly the impact of humans on the planet extends to climate. Tony Abbott: The argument is absolute crap. Tony Abbott. We believe climate change is real, yes, we believe humans make a contribution towards climate change. Tony Abbott: There may even have been a slight decrease in global temperatures (the measurement data differs on this point) over the past decade despite continued large increases in emissions associated with the rapid economic growth of China and India. Tony Abbott: I think that the science is far from settled but on the insurance principle you are prepared to take reasonable precautions against significant potential risks, and that’s I think why it makes sense to have an ETS. Tony Abbott: I think there are all sorts of ways of paying for this that don’t involve a great big new tax that we will live with forever. Tony Abbott: There is much to be said for an emissions trading scheme. It was, after all, the mechanism for emission reduction ultimately chosen by the Howard government. Tony Abbott: What we need is environmental direct action. We need action which is actually going to make a difference. What we don’t need is a whopping great new tax masquerading as a green measure. Tony Abbott: The Howard government proposed an emissions trading scheme because this seemed the best way to obtain the highest emission reduction at the lowest cost… On the other hand, artificially created markets could be especially open to manipulation… For this reason, many now think that a carbon charge scheme directed at the least environmentally efficient producers would be simpler and fairer than an emissions trading scheme. Tony Abbott: We have a policy to reduce emissions, not just to make them more expensive. Tony Abbott: In the absence of wind that never stops blowing, sun that never stops shining and tides that never stop turning; in the absence of hydrogen cars; and in the absence of nuclear power stations to supply most base-load electricity, big reductions in emissions are impossible without a big increase in people’s cost of living or a significant change in their lifestyles. Tony Abbott: The important thing is what will it do to people’s cost of living and if it drives up your cost of living it is a tax. It’s effectively an increase in the rate of GST — that’s what it is. Tony Abbott: If Australia is greatly to reduce its carbon emissions, the price of carbon intensive products should rise. The Coalition has always been instinctively cautious about new or increased taxes. That’s one of the reasons why the former government opted for an emissions trading scheme over a straight-forward carbon tax. Still, a new tax would be the intelligent skeptic’s way to deal with minimising emissions because it would be much easier than a property right to reduce or to abolish should the justification for it change. *Taken from Tony Abbott’s biography Battlelines and speeches, media transcripts and articles since mid-2009. Additional research by Crikey intern Nikki Bricknell.